The blood of the fourteen men spilled into the Homathco River before dawn on the morning of April 29th, 1864. By the end of May, 19 road-builders, packers and a farmer would be dead. It was the deadliest series of attacks by Indigenous people on immigrants in western Canada, before or since. Within six weeks an army of over 100 men were in the field to find those who had attacked the road crew and the other settlers. Finding them was not going to be easy. 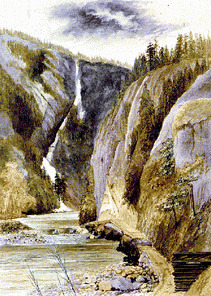 The killings had taken place in a remote triangle in central British Columbia, a country of jagged mountains, torrential rivers, and high plateau, remote from any settlements and inaccessible by road or even a horse trail. The dead had been trying to change that; they all had some connection to the attempt to build a road from the coast to the goldfields of the Cariboo. This was the territory of the Tsilhqot’in people who had lived on the high Chilcotin Plateau for centuries, perhaps for eons. The survivors of the attacks identified the principal leader of the more than 20 involved in the killings as a Tsilhqot’in chief, who was called Lhatŝ’aŝʔin (Klatsassin in historic documents – click here for the proper pronunciation). On October 26th 1864 Lhatŝ’aŝʔin and four other Tsilhqot'in men were hanged for the killings and a sixth man, Ahan, in 1865. Some 150 years later the governments of Canada and British Columbia have acknowledged that these were not murders but part of a defensive war waged by the Tsilhqot’in to protect their territories. The two governments have officially exonerated the hanged -- acknowledging a miscarriage of justice. There are many mysteries to solve here. Why did the government at the time treat these as crimes and why have views changed so now we see these as part of a war? At first the Tsilhqot’in assisted with the road building so what sparked the war? Why did Tsilhqot’in wage war on the settlers? Who was involved? Twenty Tsilhqot’in were implicated, six were eventually hanged for the killings but at least one of them killed no one. And if it was a war, how did it end and who won? On this website you will find a comprehensive collection of documents, oral histories, newspapers, paintings, and photos that relate to the events of the 1864 war and the aftermath. You are invited to become an historian, to study the evidence and come to your own conclusions about the causes, outcomes and how the war has been understood through time. You will find other mysteries here too, not the least of which is, who was Klatsassin? The name means: "nobody knows him".